Full List of This Years Best Panels & Signings Unleashed! 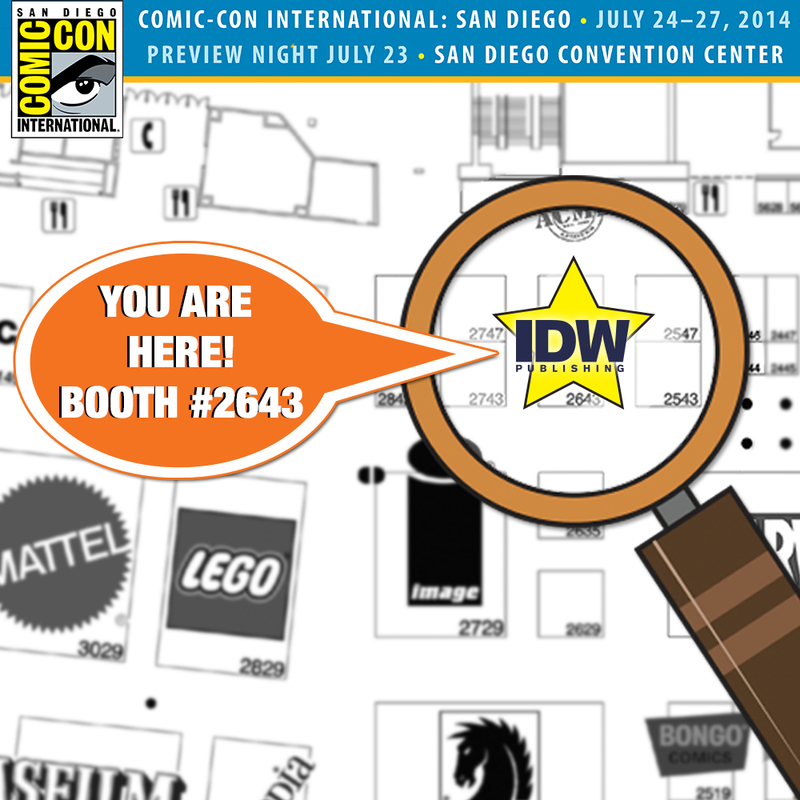 San Diego, CA (July 17, 2014) – Last week IDW released their highly anticipated convention exclusives for this year’s San Diego Comic-Con, and now it’s time to reveal IDW’s panel and signing schedule! Make sure to clear your own schedule, because you won’t want to miss any of this! IDW has an amazing list of talent signing in BOOTH #2643 this year. Come by and meet some of the biggest and brightest stars working in comics today! Row of talent in one place, all signing together! Gateway – Joe Halpin Sr., Joe Halpin Jr.
And check out all of IDW’s amazing panels this year! *Click on panel names for links that take you directly to these panels on the official Comic-Con 2014 schedule website where you can sign in or log on to bookmark these panels and sync them to your phone or calendar. Join Artist’s Edition editor Scott Dunbier as he blathers on and on about Artist’s Editions past, present and future. There will be a couple of cool announcements as well as special guests Walter Simonson, Dave Gibbons and IDW President (and art lover) Greg Goldstein—what more could you possibly want? Join the Skylanders team for an inside look at the creative process that brings Toys to Life™ –and for the first time, life to toys. I-Wei Huang, director at Toys for Bob, will explain the process of creating Skylanders’ charming roster of characters, while Richard Horvitz, famed voice of Kaos, discusses the critical role that voice-over acting plays in animating each character. Renowned comic-book writer, Ron Marz, will delve into the comic world of Skylanders and how this brand extension is taking Skylanders to a new level. Every attendee will receive limited edition Skylanders merchandise. Join President of IDW Publishing Greg Goldstein as he leads a spirited discussion about the recent boom in prestige collections of archival comic material! Joining Greg will be renowned “comic book historian” Craig Yoe, VP of Book Trade Sales at Dark Horse Comics Michael Martens, founder of Sunday Press Peter Maresca, Associate Publisher of Fantagraphics Eric Reynolds and IDW Senior Editor of Special Projects Scott Dunbier. If you have a bookshelf bowing under the weight of great big books full of comics, and still crave more, this is the panel for you! Plus — announcements and giveaways. Just added! Dean Mullaney, from the Library of American Comics! Join IDW Editors John Barber and Carlos Guzman, along with Michael Kelly, Hasbro’s Director, Global Publishing—for a comprehensive overview of all things IDW & Hasbro! Transformers! My Little Pony! G.I. JOE! Dungeons & Dragons! Announcements! Prizes! More! Featuring writer Mairghread Scott, writer/artist Tom Scioli, and many more special guests! IDW invites you to join in their 15th anniversary celebration with this panel featuring IDW’s own “Martin & Lewis,” Dirk Wood and Chris Ryall, alongside special guests Gabriel Rodriguez, Erik Burnham, Jonathan Maberry, Scott Tipton, and more to come for a spirited chat filled with announcements galore! This panel is star-studded! Join IDW Editor-in-Chief and CCO Chris Ryall, alongside special guests Eric Shanower, Gabriel Rodriguez, Jonathan Maberry, Walter Simonson, and Chuck Dixon for a lively discussion concerning the four biggest creator-owned books of the Summer, Little Nemo, V-Wars, Ragnarök and Winterworld! Legendary creator Berkeley Breathed (Bloom County, Opus, Flawed Dogs) makes a rare appearance at Comic-Con-International and—even MORE rare—will be hosting his second (and probably final) presentation. He’s a bit mysterious about what he’ll be presenting. However, there is unofficial word that he may be revealing recent illicit photos and art of his best friend Bill Watterson “borrowed” from the latter’s secret retreat in the foothills of Colorado. We’ll see you there. Get your seats early. 2014 saw the end of the Eisner Award-winning series Locke & Key come to an end. Now, join creators Joe Hill and Gabriel Rodriguez, along with IDW’s Editor-in-Chief and CCO Chris Ryall, as they discuss the end of that seminal series, Joe and Gabe’s follow-up projects (Wraith & Little Nemo, respectively) and what they have coming for the future with IDW, and who knows what else? With these 3, it’s always an adventure. Join IDW’s VP of Marketing Dirk Wood, Godzilla scribe Chris Mowry, America’s Army writer M. Zachary Sherman, Andy Schmidt from Comics Experience, special guests from Darby Pop, Monkeybrain and more, as they discuss the ever-growing slate of exciting new projects from the powerhouse publisher. Prizes, announcements, Q&A and hilarity will ensue! Join Jerry Bennington and Nate Murray from IDW’s new division, IDW Games for top secret info on the best tabletop boardgames around, including X-Files, Kill Shakespeare, Chew, Machi Koro, and more! Featuring special guest John Layman of Chew fame, and more! Who knows, you may even get to play a game or two! Come to the ultimate feel-good panel! An inspiring and heartwarming look at an uncanny team of comic book superheroes! The School of 5 and their comic books, distributed in 23 countries in Asia, Africa, and South America, are reaching 120 million people to save the lives of 5 million children who die every year from diarrheal diseases contracted from dirty hands. The School of 5, created by Craig Yoe, teach children and their families through their comic books the importance of washing with soap and water in 22 countries like India, Bangladesh, Vietnam, China, Malaysia, Egypt, Pakistan, Ghana, Brazil, and Kenya through Unilever and partners like the UN’s UNICEF, Save the Children, and local governments. Panel participants include Eisner Award winner Craig Yoe, YoeBooks.com, and Stacie June Sheldon, Lifebuoy Global Social Mission Program Manager. Come and prepare to be amazed–and get free comic books–and bring a tissue to wipe away the super tears of joy! Who’s got the best comics for kids? IDW, of course! My Little Pony! Angry Birds! TMNT! Littlest Pet Shop! Skylanders! Cartoon Network: Super Secret Crisis War! Join editors Sarah Gaydos, Bobby Curnow, David Hedgecock and Carlos Guzman as they talk all these titles and more! With special guests Louise Simonson, Katie Cook, Tony Fleecs, Andy Price, Derek Charm, and too many more to mention! Plus, free comics for kids! PREVIOUS POST Previous post: Carry All that Sweet SWAG in Style with 13 Offical SDCC Bags from Warner BROS.
NEXT POST Next post: Avengers NOW is Avengers WOW!